Jeff Dunham's show on February 16 at American Airlines Center has been postponed to June 22. Tickets purchased for the original February 16 show will be honored at the June 22 show. The Texas native recently announced the taping of his new Netflix Originals special in his hometown of Dallas. Dunham’s show at the American Airlines Center on June 22nd sold out immediately. To accommodate the massive demand, a second performance on June 21st has been added. The taping will be his second Netflix original special, and the eighth in his string of record-breaking stand up television events. In addition to the Netflix taping, Jeff is also taping a new in-depth, A&E two hour biography special set to premiere later this year. 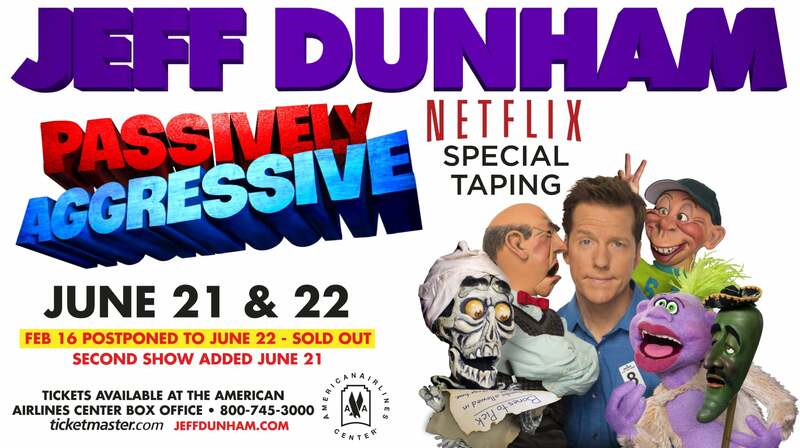 The SOLD OUT Jeff Dunham show on February 16 at American Airlines Center has been rescheduled to June 22. Tickets purchased for the original February 16 show will be honored at the June 22 show. For more information regarding parking at the American Airlines Center, click here. To pre-purchase parking for this event, click here.